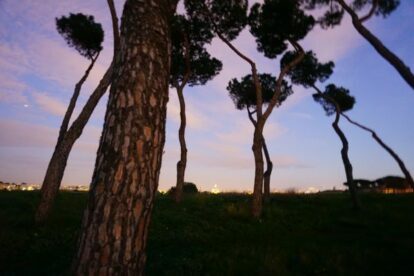 There is one aspect about Rome I’ve always been particularly enthusiastic about, that is its parks and green spaces. Not only is the eternal city full of them and the next park in Rome is never more than a few blocks away, but every single park is overwhelmingly beautiful in its very own particular way. Next to some of Europe’s biggest urban parks, there are actually 3 national parks inside the city limits! And the Pineta Sacchetti is one of them. Situated between the Monte Mario and the Trionfale neighbourhood, this huge park of 240 hectares is divided into two main zones; a plateau with hundreds of majestic Roman pine trees (some of them are up to 30 meters high! ), and secondly a widespread valley (since it’s situated between two hills), nicknamed the “Valle dell’Inferno”, which translates directly to “Hell’s Valley”. I mostly come here for extended Sunday afternoon walks, but due to its sheer infinite dimensions there are loads of people jogging and even mountainbiking in this urban jungle. Not to forget about the breathtaking and unique view of Rome you get from many parts of the Pineta Sacchetti. I personally just love the fact that I can wander around for hours in a national park, completely forgetting about where I actually am, while slightly lifting my head is enough to see the cupola of St. Peter’s and all the rest of the eternal city, reminding me of where I am again. This kind of contrast never fails to move me.